Oooh this looks interesting! SHED!!!!! Throughout this autumn, multimedia eco artist, Wren Miller, will be creating an eco studio/shed space in Shrewsbury from materials that have been discarded, or “shed”. Her aim is to make her SHED at practically NO COST through collecting discarded materials and asking people to ‘crowd fund’ time and materials, such as used timber, sheep’s wool, bales, tyres, soil, etc. Many different eco building techniques will be employed in the making of this small, modular building. These are traditional and innovative; – simple methods which have stood the test of time and the British climate. Wren spent time in the UK, Africa, Poland and the USA learning eco techniques first hand from experts before teaching her Shropshire and Arts Council funded Eco Encounter workshops in Britain. 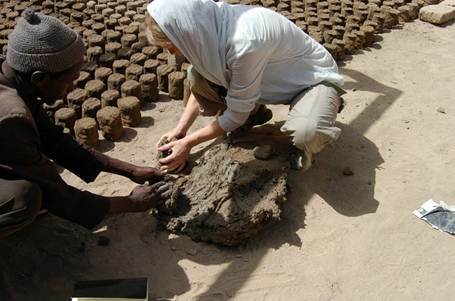 In the image below, you see Wren, the first woman adopted by the Master Mason Society of Djénne, working with the President of their society inside the UNESCO protected mud Mosque, in Djénne, Mali. Wren will be sharing all stages and building processes of the SHED on her blog http://wrenmillerart.co.uk/shed/ and teaching eco build fundamentals in her practical workshops at her covered, outdoor classroom, in Belle Vue, Shrewsbury. All workshops are priced £35/day and run from 10h00 – 16h00. Please get in touch with Wren or visit http://wrenmillerart.co.uk/shed/ to book your place on any of the workshops. There are limited places, so it is important to book early. Volunteers are welcome during some week days with prior arrangement.